The team killed it. The presentation was flawless. The proposal was outstanding. You covered all of the bases, but you lost. Searching for answers, the only thing you can think of is that the other guy must have “bought the deal,” right? 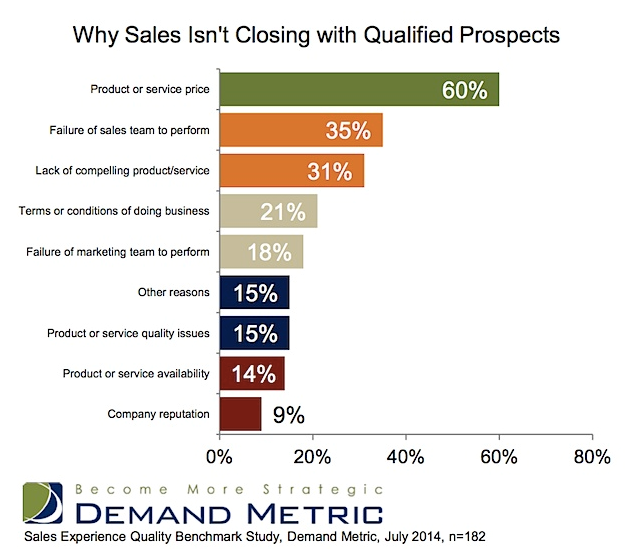 In the article titled “Why B2B Sales Leads Don’t Convert (and Who Is to Blame),” Marketing Profs highlights a recent survey of nearly 200 marketers, sales professionals and presidents/CEOs on their thoughts on why deals were lost. Not surprisingly, 60 percent said that price was the main reason, but what may surprise you is that the percentage is wrong. To truly understand why deals are lost, you have to seek feedback from buyers. Having conducted numerous post mortem analyses of lost deals, and buyer behavior research, here’s what I have learned. Roughly one-third of all buyers consider price as one of the drivers, or the main driver, of a purchase decision. Pure price buyers represent about 5 to 10 percent of all decision-makers. The remaining portion (20 to 25 percent) are value buyers who may – but don’t always – buy the lowest-priced product or service. Using those numbers, the research overstates price as the reason for a loss by a factor of 2x. What accounts for the remaining 30 percent? 1. Low investment in the relationship. Deals are not solely rationally made on purchase transactions, especially as price and product complexity increase. Selling bigger-ticket items involves a degree of trust built between a vendor and a buyer. Recent research by Fortune and gyro found that 65 percent of executives believe subjective factors that can’t be quantified (like a company’s culture and values) make a difference when evaluating competing proposals. Even more executives (70 percent) said that a company’s reputation was a critical consideration in the decision-making process. Investing in relationship-building with buyers takes time, but as the research shows, it’s worth it. If buyers say that the only time they see a rep is when he or she wants to sell them something, that investment is not being made. 2. Focusing on the wrong message. Focusing on only selling the business value (functional benefits, business outcomes) of a product limits the sales ability to make the case for a higher price. Connecting the value the product delivers to the buyer, on a personal level, helps reps broaden the conversation. 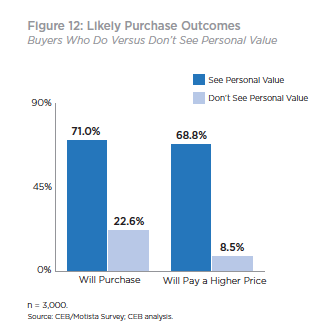 According to CEB research, not only are you twice as likely to win the deal by focusing on personal value drivers (professional and personal benefits, like a promotion, admiration from peers, etc. ), but buyers are also eight times more willing to pay a premium. To do that effectively, sales people need to be able to put themselves in the shoes of decision-makers. They need to understand their buyers’ situation, role, relationships, etc., and sell the value of the product or service to those unique needs. If reps only know how to sell “feature functionality,” the conversation all too often comes back to price. 3. Missing the real buyer. There is no guarantee that past buyers are going to be key decision-makers in future purchase decisions or on other types of products. Years ago, I did a post mortem analysis for a medical equipment company on an innovative product. The sales team said they were losing deals because the equipment was priced too high. The analysis proved that they were both right and wrong. The traditional buyer did, in fact, believe that the product was priced too high compared to others in the market. However, a new set of users who had become the primary decision-makers emerged. This group was using the innovative technology as a revenue-generating procedure. As a result, they valued the product differently and were willing to pay a premium. Deals were lost because the company didn’t understand how buyers intended to use the product, and as a result, they missed the key decision-maker. The simple answer is that deals are lost because the case for the value of the product or service has not been adequately expressed to meet the needs (professional, personal or both) of the key decision-maker. Blaming price is a convenient crutch that shifts accountability to the product or pricing team and away from sales and marketing. Finger-pointing may make us feel better about our role, but it doesn’t fix the problem. If you are truly intent on increasing win rates, you must dig deeper into understanding why. I can guarantee six out of 10 times that you won’t find it is price.